Rice, PEASS, vegetable oil, sugar, PEANUT, WHEAT, tapioca, salt, SOY, mod. CORN starch, lactose, seaweed, chicken, MILK, maltodextrin, onion, wasabi, garlic, MUSTARD, yeast, coloring: E150c, E102 , E133, E141ii, flavor enhancer: E627, E631, sodium caseinate, stabilizer: E340ii, emulsifier: E472e, release agents : E554, E551. May contain traces of NUTS, EGG, celery and SESAME. Can affect activity and attention in children. Tastiest rice crackers, which are coated not just with traditional Japanese soy sauce, but also with a touch of wasabi. 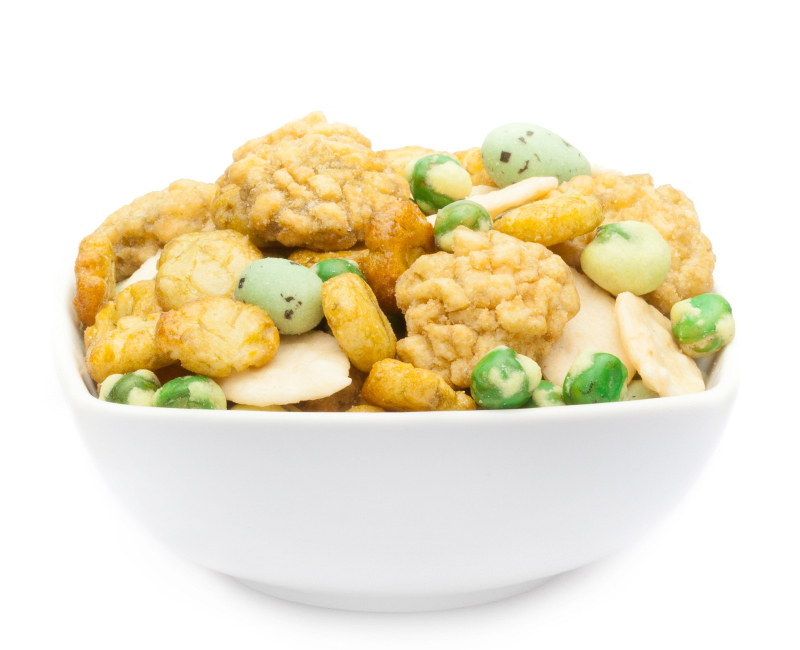 Given our gorgeous Wasabi Peas and peanuts in crispy wasabi. The best ingredients, excellent wasabi seasoning, the increase from piece to piece in its Wasabi sharpness. So have a look to a snack, departs on every Wasabi Junkie. The delicious taste of Japanese horseradish, well represented. 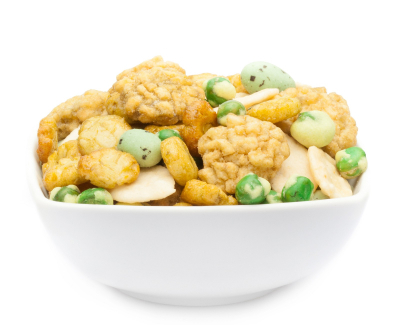 Since the eye is not too short to come even with this snack mix, of course, it is not surprising that we have dipped this snack in gorgeous greens that reflect the Wasabi theme. So the Wasabi Feeling is perfect! A snack as green as wasabi is sharp. Wasabi is the generic kick for your taste buds. Your nose and all your taste buds will be delighted by the incredible sharpness of Japan's horseradish. Our rice crackers we have undergone a little wasabi shower so that the originality of this little delicacy get's not lost. Our peanuts we have then subjected to the full shower in the form of a crisp green wasabi layer and in the original Wasabi Pea, there was no way stopping them: Pure Wasabi! Get ready for the first taste buds touch with our spectacular WASABI MIX. Each piece of our WASABI MIX will catapult you with its slow increase in flavour intensity and closer to the Wasabi sky. You start very slowly with the white, decorative shaped rice crackers that are a promise of "more". Continuing with the small, pale green round crispy rice pillows which already give a glimpse of where the taste journey still goes.When do you have the large, round cracker in your mouth you realize that's indeed a pleasurable promise, however, can not yet be the ended. With the green-black-jacket Peanut, you are the taste target: the aromatic-spicy Japanese horseradish rises pleasantly sharp in your nose. You can reach the zenith and then be finished with the small, refined and inimitable intense spicy wasabi peas. Once you've tasted it, you have a sense of what it means to have climbed the Wasabi sky with a small journey through this fantastically green snack combo.